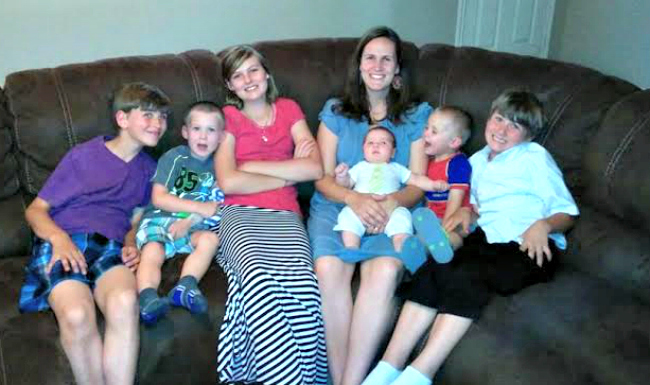 I am a wife of 14 years and mother of 6 children (one daughter and then 5 boys). I love to have fun and laugh. One of my favorite things to do is to have a pie fight (cool whip is awesome) with our family and other families. We have really been into playing kickball as a family, although it usually ends in tears from the team that loses. Along with my family responsibilities, my Mom and I have been working on a book about healing from the effects of suicide. This is a project we started after some major promptings from the Lord. It has been such an incredibly rewarding experience and has expanded my understanding of the Atonement of Jesus Christ. I feel that my greatest accomplishment is also my husband’s greatest accomplishment-that is that we have always obeyed the Lord when He has asked us to bring children into the world. We have never regretted choosing to have a large family. I feel the greatest happiness when I listen to promptings and when I am obedient to what the Lord wants me to do. I feel happiness when I attend the temple and feel the peace that it brings. I feel happiness when my family is all together doing silly things, laughing, feeling the Spirit, or doing service. I love watching videos of the Savior and reading scriptures of when He was on the earth. I gain so much from His example, His teachings, and His obedience to do the Father’s will. When I apply His teachings to my own life, I am happy and make others happy. When I fail to apply His teachings to my own life, I am unhappy and make others unhappy. I feel that one of my spiritual gifts is the ability to believe in the spiritual experiences of others. One day I was praying and thanking Heavenly Father for having such a wonderful spiritual experience. The Spirit told me that because I first believed in the spiritual experiences of others, I was granted spiritual experiences of my own. I absolutely love reading spiritual experiences of others. I am so grateful for the courage of others in sharing their spiritual experiences that I can learn from them. Many times others’ spiritual experiences lead me to asking questions about my own circumstances. I am very fortunate because my parents really helped me understand the importance of prayer. My parents did not make decisions for me or try to control me. Instead, they always encouraged me to pray about certain decisions that I had to make and trusted me that I sought the Lord in navigating situations. Because they always turned me to the Lord, I had faith in Him and knew that He was listening to me and that He would answer me. Because of my parents’ confidence in my ability to listen to the Lord, I knew that I really could receive answers to prayers. I think having faith in the Lord and yourself is crucial in receiving answers to prayers. Answers to prayer come in many different forms and methods. One particular way that I receive answers to my prayers is in spiritual dreams. I have found that this is a way the Lord chooses to communicate with many of His children, today as well as in times of the scriptures. Sometimes it is obvious that we have received an answer to prayer-like when it rains after a community has prayed for rain. Sometimes when I am reading the scriptures a certain verse or story from the scriptures will stick out in my mind and the Lord helps me understand things in a new way to answer my prayers. Other times I have thoughts in my mind that are the soft whisperings of the Holy Ghost. Because I am a very anxious person, sometimes I wonder if the inspiration/soft whisperings are from God or my own thoughts. In these times, I stop what I am doing and pray to know if those thoughts in my mind are really from God. This has been very effective for me. Many times when I am praying about something, I have a conversation with the Lord. It is not a one sided thing. I ask Him things and wait for an answer. The answer usually comes as thoughts or ideas. Then I usually have more to say or more questions or insight that is desired and He usually has more to tell me. It truly is a conversation between a parent and child. Answers don’t always come right away. Sometimes answers come after a lot of work/research on a certain topic, reading scriptures, attending the temple, and doing other things that draw me near to the Lord. No matter the timing or method, I do know that He always answers. There have been times that the Lord’s answer to my prayers is not what I want to hear or things I want to do. Sometimes they are things that I know others would not approve of. I have really come to know and understand that it does not matter if I want something a certain way or if others think I should do something a certain way. All that matters is that I do it the Lord’s way; that is always the best option. 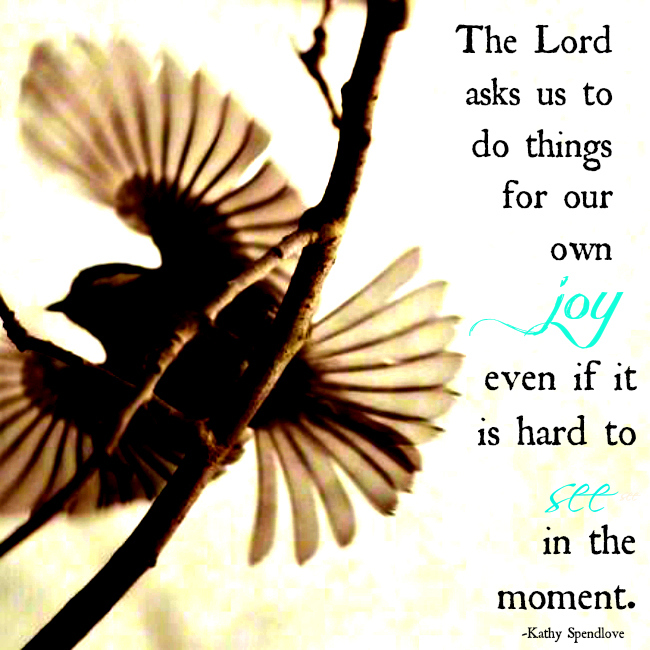 I know the Lord asks us to do things for our own joy, even if it is hard to see in the moment. I was raised a member of the Church of Jesus Christ of Latter-day Saints. Growing up, I had wonderful parents and leaders that taught me the gospel. I had many spiritual experiences as a youth that helped me know of its truthfulness. When I was 18, my friend started taking the missionary discussions. One day, she was being taught about Joseph Smith’s First Vision. She told me that it was way too far-fetched and crazy. It hit me like a ton of bricks and I thought to myself how it really did sound crazy. 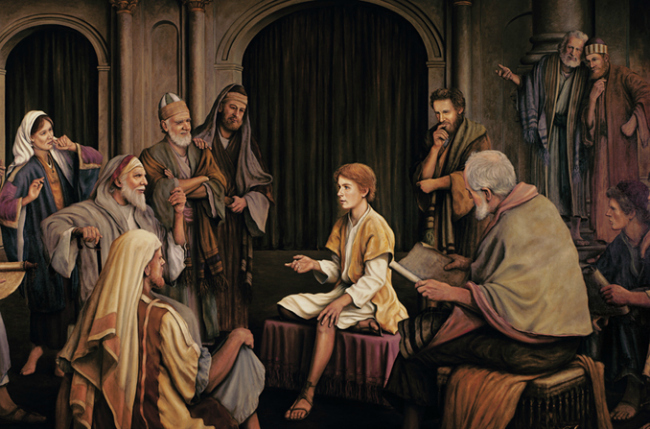 I talked to my Dad, who is a convert, and he told me about how Joseph Smith’s story was one of the things that he really liked about our church. That gave me a lot of comfort. Then, I started to really study that aspect of our church and really pray about it. I received such a witness that Joseph Smith did see God the Father and Jesus Christ. I can never deny that witness I received when I was 18, or the witness that I still receive today when I talk about Joseph Smith’s First Vision. The more I have studied the scriptures, the more I have come to understand that Joseph Smith’s First Vision was not some crazy story. Rather it is completely in line with others’ experiences in the Old Testament, New Testament, and Book of Mormon. God loves His children and speaks to them. It is that simple. I love talking about the gospel and love when people have questions about what I believe. My hope is that all women will feel loved and important and not compare themselves to others.